I enjoyed the keynotes I attended, mainly Tanner Corbridge’s Accountability talk based on the “Oz Principle” model. I was familiar with the model but this keynote deepened my understanding and came at a time where it is applicable to several situations I’m thinking about. Tanner is also a brilliant keynote speaker. Engaging, Fast, just the kind I love. James Grenning also delivered a very good talk about Demanding Technical Excellence. It was well built and he is a good speaker as well, but it didn’t provide any new thinking from my perspective. Just emphasized things I already know and advocate strongly already. One piece I liked is the physics of Debug Later Development versus Test Driven Development. I missed Clarke Ching’s keynote but I heard it was good. 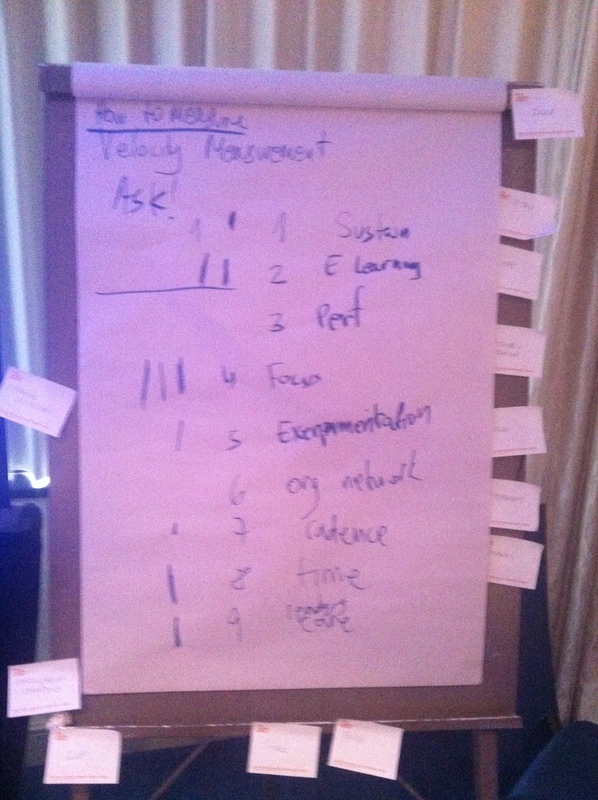 The track sessions were more of a mixed bag (as they typically are in many conferences). I found several time slots where I wasn’t really passionate about any of the topics, and some where I was interested in the topic or presenter and was disappointed from the level of the session or quality of delivery. It might be that I’m losing my patience for sitting and hearing sessions, but OTOH there are conferences where I’m glued to my chair (typically the hashtag starts with #L for those ones…). I found many of the sessions to focus on the technical aspects of Scrum and Agility, not enough talked about the big picture, systemic view. Ideas like Social Complexity Theory, Lean, Real Options, Risk, Dealing with executives were nowhere to be found, at least in the sessions I attended. The openspace was an active and engaging one in general. I ended up being a bit of a bumblebee though. The session I liked most was a Build your own Scrum session that Adam Weisbart delivered – it is an exercise for introducing scrum or refreshing knowledge of scrum, that can be delivered as 30 minutes or longer 2-3 hours for a more comprehensive version. Quite cool and I will try it next time I have a chance. I also suggested and tried some modifications to the way it is run (e.g. use team estimation game while building your own scrum to make it a more fair group collaboration process). What is Kanban – Did a 10 minute session describing the foundational principles (start where you are etc.) 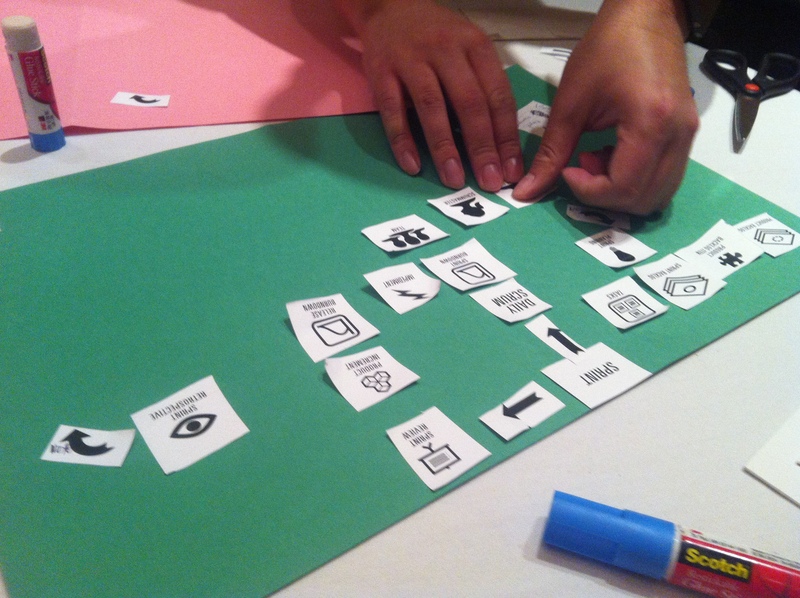 and the core practices (visualize, manage flow, make policies explicit, THEN limit WIP, improve collaboratively). People appreciated leaving the Limit WIP as the last core practice. Described Scrumban – Using Kanban to improve the flow/leanness of a Scrum instance – gave the FiftyOne.com story as an example. Described starting with Kanban and then using elements of Scrum using the an example of Discovery Kanban and then feature teams. I also mentioned that the value of starting with the Discovery Kanban was the involvement of managers in it up front, leading by example, experiencing, and that now when starting a feature team it is quite smooth and happening while I’m in the US. People were quite happy and nodding to hear about this. Which is better Kanban or Scrum? I added WHEN to that question… and we discussed revolution versus evolution, that if you are REALLY able to do Scrum RIGHT go for it. But if you are doing Scrumbut including no real feature teams but chains of component or semi-feature teams you should consider Kanban. Emphasized the “its only the start of the journey” and they both are meant as inspect and adapt frameworks using my mountain sketch which people really liked. 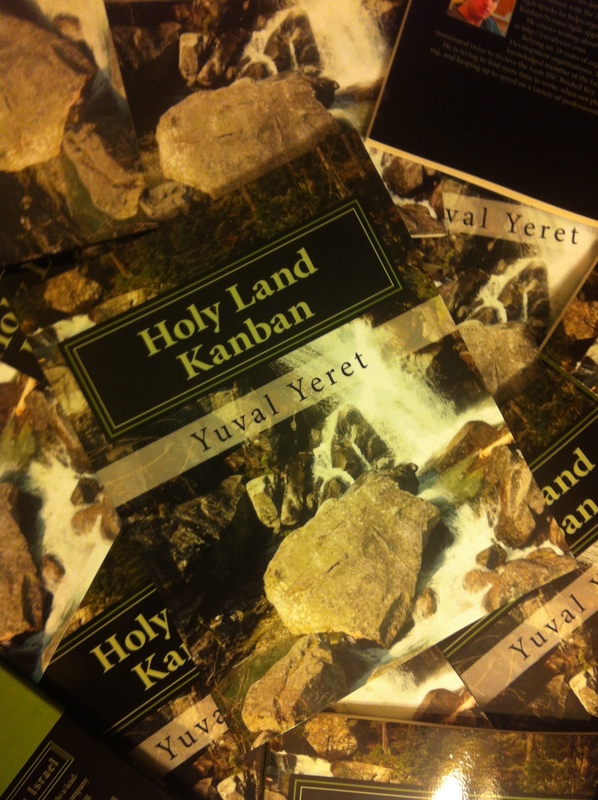 I brought 25 books of “Holy Land Kanban” and all are gone and some people didn’t get a copy and I promised them an ebook by email. I was able to connect to several people after that session, some of them are also coming to Lean Conference Boston next week. I delivered a talk about “Continuous Improvement is broken/stalled – WHY and WHAT can we do about it”. The talk was well received from feedback I got from people who were in the room. I was also encouraged that people really loved the Prezi format and didn’t find it confusing or sea-sickness-inducing. I’ve been focused on making it an easy to consume Prezi so it is good to hear that feedback. In an exercise of prioritizing the Improvement Manifesto people emphasized the Focus and Learning pillars of my talk, which are my favorite concepts as well. We did several kinds of discussions around what agile practices/choices are sure bets and which are hypothesis, we tried to design a minimum viable change, and we also talked about what is the Kanban Method for Change just in case… The Prezi is available below. Bottom line it was an interesting experience. On a personal level I was able to reach out and spread some of my beliefs and knowledge which feels good. In spite of coming in as a stranger to this community I was able to make some connections that will at least continue on twitter I hope. I also learned a couple of new things in areas I don’t typically focus on and refreshed the importance/usefulness of other practices/exercises I’m familiar with. It was overall a well-executed conference and I’m glad the organizers invited me to speak and participate. I look forward to checking out future Scrum Gatherings to see where this world is going… Anyone for Barcelona in October? 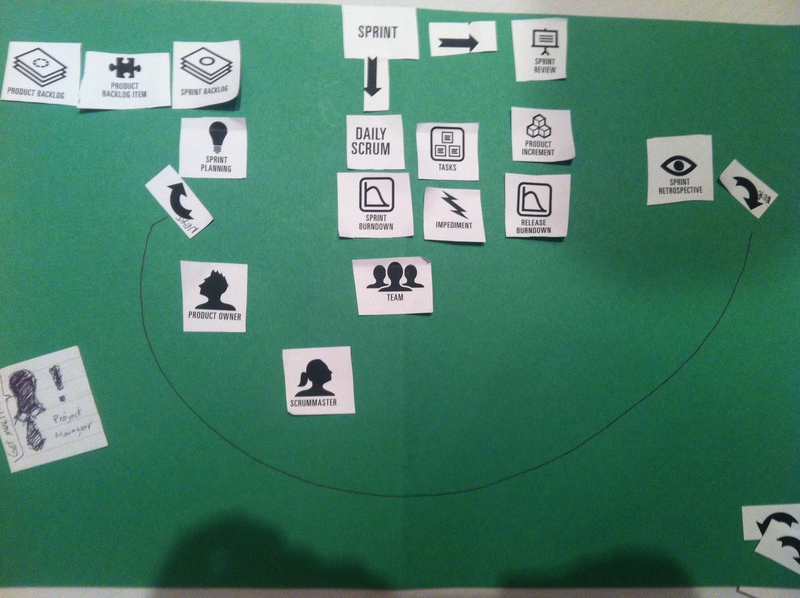 This entry was posted in Events, Scrum on May 10, 2012 by Yuval Yeret.